On June 3, the Construction Management Association of America (CMAA) Metro New York/New Jersey Chapter hosted their 23rd Annual Awards Banquet at the Yale Club in New York City, where the Reconstruction of the Fordham Plaza Project was the Category 1 – Less than $20 Million – award-winner. The New York City Department of Design and Construction (NYC DDC) shared the joint award with CH2M. As an agent of the NYC Department of Design and Construction, CH2M managed construction for the design-bid-build initiative to improve the Fordham Plaza intersection, previously called one of New York's most dangerous intersections. The NYC DDC led the design initiative for roadway improvements and an upgraded public plaza. As an agent of the NYC DDC, CH2M managed construction for the design-bid-build initiative to improve the Fordham Plaza intersection, previously called one of New York's most dangerous intersections. 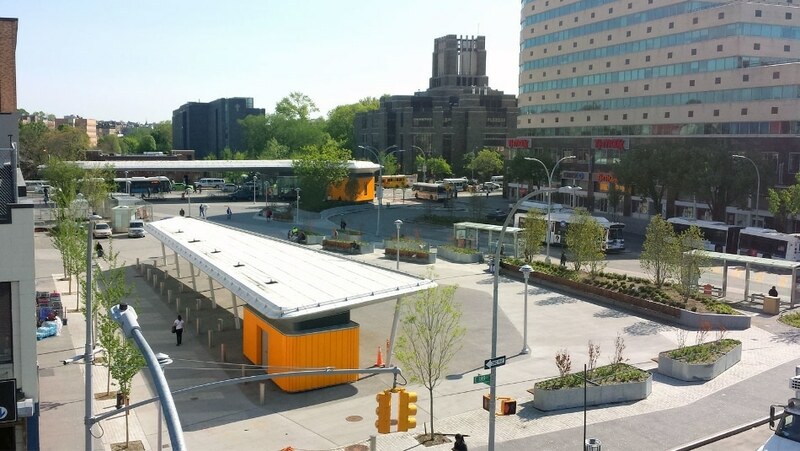 The project, which received funding from the United States Department of Transportation for its improved safety, mobility and livelihood impacts for The Bronx, added a café building, a market shed canopy for street vendors, three food kiosks, various surface colors and textures of sidewalk concrete, eight steel planting boxes, two concrete planting boxes, numerous tree pits, built‐in seating areas in the plaza and more. The Fordham Plaza and surrounding area is one that CH2M's resident engineer on the project, Patrick McNierney, knows well. Having spent his early childhood just blocks from the project site, McNierney proudly led the company's efforts to enhance the safety and liveliness of his old neighborhood. He shared, "I lived three blocks away from the site as a small child. I remember the old neighborhood from the 1960s! The last three years have been like a homecoming for me – a successful project just came as a natural course of events. It's an honor to receive the award from CMAA recognizing the benefits this project will bring to an area that's very dear to me." The CH2M team performed all services necessary and required for the inspection, management, coordination and administration of the award-winning Reconstruction of the Fordham Plaza, including upgrades to bus shelters and passenger waiting areas benefitting 41,000 daily bus patrons, enhancing access to the Metro North station for 11,000 daily commuter rail passengers and increasing safety for 80,000 daily pedestrians in the area.